Animals other than humans learn how to communicate via the manual modality. Gestures are also important in the communication of great apes. Mothers of chimpanzees, for example, communicate with their infants mainly by tactile, later by visual gestures. Infants also rely on vocalizations and actions, especially older ones. 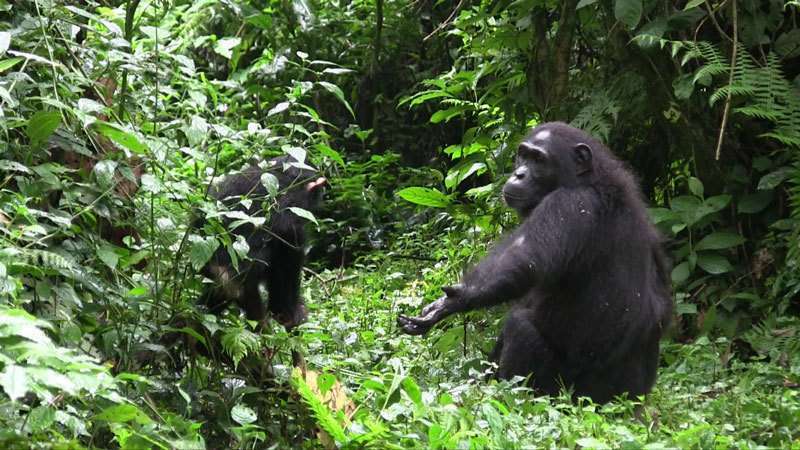 This is what researchers of the Max Planck Institute for Ornithology and colleagues have observed in two chimpanzee species and communities of wild chimpanzees in Uganda and the Ivory Coast over two years and they found many parallels in the communication culture between the groups. Across cultures and languages, human children enter language hands first. Comparative research into language origins has therefore, beside vocalisations and multi-modal combinations, been focusing on gestural complexity and underlying cognitive mechanisms in our closest living relatives, the great apes. Recent studies showed that gestures are used as intentionally produced, elaborate and flexible communicative strategies and play an important role in great ape societies. However, researchers have so far mainly focused on captive groups or single communities in the wild. Now for the first time, Marlen Fröhlich and Simone Pika of the Humboldt Research Group at the Max Planck Institute for Ornithology in Seewiesen in collaboration with colleagues of the Max Planck Institute for Evolutionary Anthropology in Leipzig carried out a systematic comparative study of gestural signalling. In two consecutive years, they studied two chimpanzee species and communities in Kibale National Park, Uganda and Taï National Park, Ivory Coast. "One of the most intriguing questions was, whether individuals living under active selection pressures and in different communities show the same 'culture' of communication", says Marlen Fröhlich, first author of the study and PhD student at the Max Planck Institute for Ornithology in Seewiesen. The researchers focused on interactions between mother-infant dyads to initiate joint travel. The results showed that chimpanzee mothers preferentially used gestures to initiate joint travel, while infants also relied on vocalizations and actions. Especially in older infants (older than two years) vocalisations were frequently combined with visual gestures. In young chimpanzees, a developmental shift from actions to gestures and from tactile to visual gestures was found. The study also showed that chimpanzee mothers seemed to have an understanding of the communicative ability of their infants. "I was really intrigued to see how patient and tolerant chimpanzee mothers can be when prompting their infants into leaving a location and traveling together to a new one", says Marlen Fröhlich. In both communities, mothers were the main initiators of joint travel and each mother seemed to use her own individual communicative tool-set. "We thus think that it is time to reconsider current theories on gesture acquisition and postulate a revised theory of gestural acquisition— 'social negotiation'", says Simone Pika, head of the study and the research group in Seewiesen. This theory suggests that individuals 'socially negotiate' whether a given behaviour can also be used communicatively and learn that social constellation and context assigns different meaning/s. For instance the same gesture of the mother, an outstretched arm, might function as a play invitation in a relaxed setting but signals urgency when accompanied by her fear grin and an aggressive male approaching. However, further observations are necessary to test this theory in detail and to clarify whether gestural acquisition indeed involves shared understanding and mutual construction in real time by both interactants. Chimpanzees: Alarm calls with intent?